At first the building was designated as a community centre but the parents of young families were desperate for a nursery after fatal accidents involving children crossing the busy by-pass which divides the barrio from the nearest alternative school. 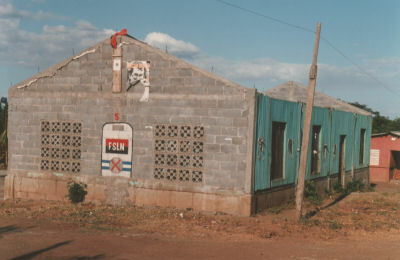 Los Pollitos opened with 32 children but closed in 1991 when the new UNO government withdrew subsidies to education. More children were hurt crossing the road and many didn’t go to school at all. This was when IMFA started paying the first Teacher, Thelma Calderon. 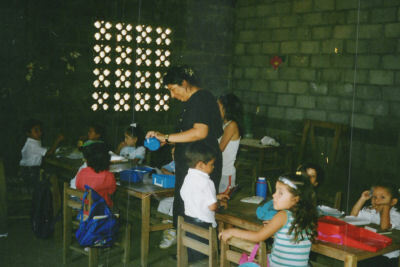 More children flooded into the school and Ernestina Balladares, now the head-teacher, joined Thelma.The school became more and more popular and a third teacher, Maritza Morales, was taken on by the community. Back in London we were beginning to understand what it meant to be a “victim of your own success”. At this time IMFA was raising money any way it could. We sold books, we held parties on the Thames (RiverBoat Rhumba) and we cooked food at parties. This was sufficient for one off donations but not reliable enough to guarantee salaries. In 1999 we started “Sponsor a Teacher”, standing order donations which is how we raise the bulk of funds today. In 2004 we sent a donation of £500 which was used to build a toilet block and convert the liberated space into two more classrooms. 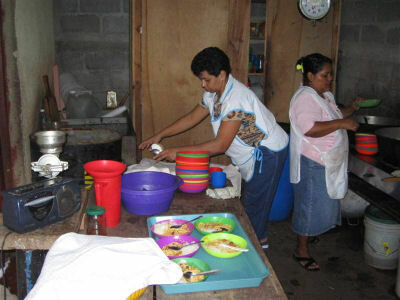 A kitchen was also built on the side of the school by a Spanish NGO called “Entre Pueblos”. 180 children including all those at the school receive a nutritious meal everyday. The parents in the barrio were so pleased with Los Pollitos Nursery school that they wanted to keep their kids there for Primary education too. The only other Primary schools in the area are either over subscribed and the wrong side of the bypass or private and beyond the means of the parents. Since 2005 the first three levels of Primary education have been taught in the school. This has meant three more teachers and more salaries to find. In 2006/7 we funded a new roof for the school. The new one has iron rafters so should last a long time even in the corrosive tropical climate. Old bits of roofing were used to make a porch and there was also enough left over to make some attractive railings and paint the building. The community always make sure the money goes a long way. In 2008 the mayor’s office in Managua funded a new fence round the school while we have paid for rendering, painting and new doors. 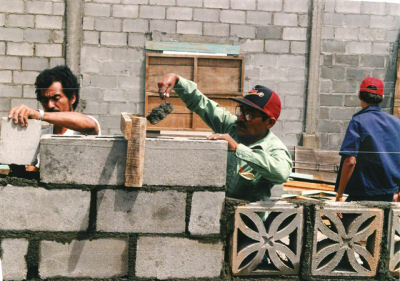 In June 2009 IMFA sent $6000 to start building 3 new classrooms which will fulfil the parents’ dream of offering full Primary education at Los Pollitos. We only expected one classroom to be build with this amount but have been astonished at the progress. Another $3300 was sent in October 2009 and the new classrooms were completed in early 2010 and are currently being used for the nursery school classes. We finally realised the parents' ambition to provide a full primary school as well as the Nursery. We were paying 9 teachers to look after 260 children - more than we ever thought possible. We funded the construction of two new toilet blocks (see Projects). We paid for painting; the fabrication of new metal sign; new wooden doors and tables for the teachers. We also increased salaries. We built a playground at the rear of the school and dedicated it to Ian Birchley - one of greatest supporters. We replaced the roof on half of the old building and increased salaries again. We sent £6,500 to start the building of an office, library and computer room. Uniforms from St Pauls' Cathedral School were gratefully received. The new building is unfinished but we hope to complete it next year. Then we will need to find books and computers! Sign up to help IMFA here.